Welcome to our home away from home. 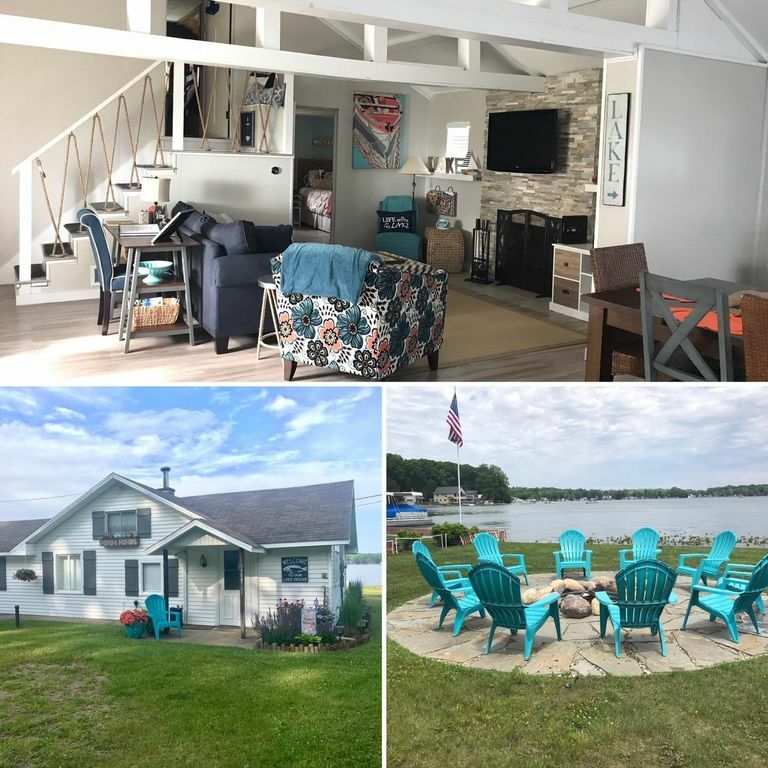 We recently renovated this 2 bedroom, 1 bath lake house and can't wait to share it with you and your family! It sleeps 8-10 comfortably. It features a first floor master bedroom with king size bed, a great room with 1 queen sleeper and 2 twin sleeper sofas, fireplace, flat screen tv with cable and a dvd player, large dining room table for family dinners or late night games. Additional hi-top table with 2 chairs and a desk make it ideal for everyone. The kitchen has all stainless steel appliances and fully stocked with everything you need to make your stay easy. A full bath with tub for the little ones and plenty of towels! The 2nd bedroom is located upstairs with 2 twin built in beds and a queen size bed. The house has central a/c for those hot summer night and a ceiling fan to keep is relaxing year round. The house sits on a large lot with over 90' of lakefront. Early morning cups of coffee watching the sunrise is one of my favorite parts of the day. There is a pier that is perfect for docking your boat, swimming off or catching a great variety of fish. The all sports lake offers over 500 acres of water, 2 sandbars and a beach across the way that you can anchor your boat for some fun. After a day of sun, relax on the deck, set up the chairs and gather around the huge custom fire pit. An evening walk around the lake will get you 5 miles of exercise. It's only a short walk down to Indian Hills Golf Course which includes 27 holes. There are numerous wineries and u-pick fruit farms in the area. A short drive to the drive-in movies, a round of mini golf, restaurants, shops even a casino are all within 10-20 minutes of the house. South Haven, St. Joe, Benton Harbor and South Bend are all within an hour and offer plenty of activities too. We have 2 kayaks, 2 paddle boards and a paddle boat available for use. Boat rentals are available at the nearby marina. Our family lives in the southwest suburbs of Chicago. Its a quick 2 hour drive for us! We looked for the perfect property for 3 years and finally found this one. It was in need of some TLC and we thought it would be the perfect project where we can put our own touch on it. We are thrilled with the results and couldn't be happier! We have been coming up to this area for years and fell in love with Indian Lake for the conveniences, beauty and low boat traffic this lake has in comparison to other nearby lakes. Its a hidden gem! Sheet sets for all beds including extra blankets and pillow. easily fits 5- 6 cars and room for boat trailer. Open concept with view of lake. New Keurig coffee maker plus a 12 cup coffee maker with timer and paper filters supplied. basic pantry items including salt and pepper, some spices, sugar & flour. Dinnerware for 12, utensils, pots and pans, cooking and baking dishes, measuring cups, wine glasses, tumblers, plastic cups and plates. Must be a minimum of 25 years old. No bachelor or bachelorette parties allowed. Great location right on the lake. Beautifully decorated! Great time away despite the weather! We had a great relaxing time away on Indian Lake. The owner, Jill did a wonderful job with the updating of their place and it was also decorated for fall! Pumpkins and all! Gave you a welcoming feel! She cares. We were able to kayak even though it was really cold and also had a camp fire one night. (She was right, with the heavy rain prior to our stay, we had to scoop out the fire pit, so we could have a fire.) If you have any questions, She responded quickly. We would go back again! Beautiful Pinterest Home with tons of Adventures! This home was perfect for a girls weekend getaway! The home is decorated beautifully! There are tons of beds! Tons of kitchen utensils! We were able to enjoy the fire pit and the beautiful lake! We will definitely be back in the future! Jill has done an amazing job making this home a wonderful place to retreat and relax. Her eye for decorating is evident in every inch of the house, and she thought of every detail to make life enjoyable for her guests. We enjoyed the small private beach, use of the paddle boat and kayaks, and spent many hours just enjoying wine on the cozy patio. We will definitely be back for another stay! Super cute and clean property. The Jillypad was well maintained and decorated beautifully. The house had a great shallow entry to the lake for the kids to safely play in and the entire family enjoyed all of the water toys available...kayaks, paddle boards, paddle boat. A great relaxing getaway and an easy ride from the Chicago area. Our family has vacationed in MI 10+ years and Indian Lake is our favorite location! This house is fully stocked with all your indoor needs as well as outdoor fun and games. We hope to return next year. Thanks Sheri! We’re so happy you enjoyed Indian lake as much as we do! $500 refundable security deposit is required 7 days prior to arrival.